Direct observation of chemical reactions is notoriously difficult. Reaction rates tend to be too fast for chemists to be able to see how molecules move as they combine and change, and individual electrons — the species that are directly involved with reactions— are subject to the laws of quantum mechanics that make direct observation of their position impossible. It’d especially difficult to observe reactions between organic molecules involving catalysts, because the reactions can take place at extreme temperatures and pressure, often proceed via very short-lived and unstable intermediates formed by combinations of the reactants with the catalyst. This makes it difficult to determine the mechanism of the reaction, which in turn complicates the design of improved catalysts. 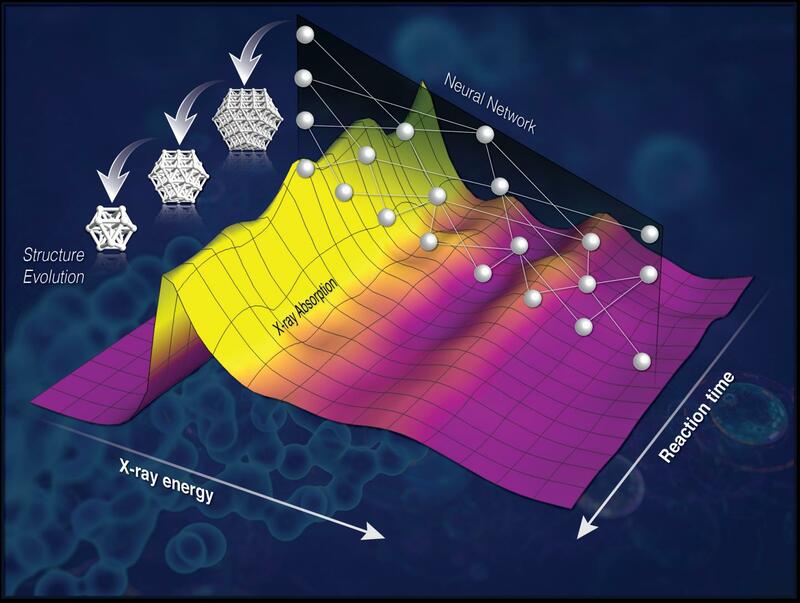 An interdisciplinary team of chemists, physicists and computer scientists at the US Department of Energy’s Brookhaven National Laboratory in New York State and nearby Stony Brook University have devised a method to analyse data from X-ray crystallography to decipher the three-dimensional nanostructures that form during catalysed reactions. The method relies on neural networks and machine learning to study previously-inaccessible information. The method is particularly effective for reactions at high temperatures and pressures. These conditions interfere with the absorption spectrum of X-rays interacting with the system, causing the characteristic ripples in the X-ray spectrum left as the waves diffract around atoms to become smeared out and complicated. However, the team realised that a part of the X-ray spectrum at a lower energy contained the information needed to determine the reaction intermediates. “But this information is hidden ‘below the surface’ in the sense that we don’t have an equation to describe it, so it is much harder to interpret. We needed to decode that spectrum but we didn’t have a key,” explained Janis Timoshenko, a postdoc working with Frenkel at Stony Brook and lead author on a paper describing the research in the American Chemical Society’s Journal of Physical Chemistry Letters. Two Brookhaven researchers, computer scientists Yuewei Lin and nanomaterials specialist Deyu Lu, have developed machine learning techniques which they used to teach computers how to find connections between these lower energy absorption spectra and the structural details of the catalyst. The team used theoretical modelling to produce simulated spectra of several hundred thousand model structures, and used those to train the computer to recognise the features of the spectrum and how they correlated with the structure. “Then we built a neural network that was able to convert the spectrum into structures,” Frenkel said. They tested this network by seeing whether it could determine the structures of well-known platinum nanoparticles that Frankel had previously studied, and achieved successful results. Brookhaven is the home of a synchrotron X-ray source similar to the UK’s Diamond Light Source in Oxfordshire, and catalysed reactions are frequently studied there. Frenkel’s work will allow researchers to obtain real-time structural information on why reactions slow down or produce unwanted product mixtures, and to tweak reaction conditions or the structure of the catalysts themselves to improve outcomes. This will offer completely new methods of using synchrotrons for research into catalysed reactions in progress, Frenkel claimed.